Due to restricted zoning, Arrowhead Trails does not allow any bachelor or bachelorette parties or other large gatherings. 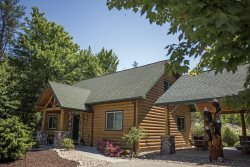 This home provides a true family getaway in the Wisconsin Dells. Arrowhead Trails is just minutes from the excitement the Dells has to offer, yet removed from the hustle and bustle. This is a perfect getaway for a single family, yet with 5 bedrooms there is enough sleeping capacity for two families with plenty of privacy for parents and children. Enjoy nature`s peace and quiet on 3 acres of woods and fields with walking and hiking trails. (NO Hunting or ATV's allowed!!) Or take a short 5-minute drive to launch your boat at River Bay Campground. There's a fully-equipped kitchen, wood-burning fireplace (in season), satellite TV, WIFI, central A/C, as well as a washer/dryer. Fire up the gas grill on the deck or play some basketball or volleyball (bring your own balls) or enjoy the outdoor fire pit behind the house near the woods -- all at Arrowhead Trails! Arrowhead is my favorite property I have Stayed in within the past 4 years. Sand County has a wide choice of properties, and is serviced by an experienced staff of friendly people! Arrowhead Trails met all our needs: cost, location and size! Team was great !Sand County is fantastic to work with. Pricing is great, and the staff is top notch. They really have this down to a science. The team members we encountered were great and extremely helpful! We bought tickets to Timbavati during check-out and the ladies in the office were very pleasant and helpful. The office did not have enough tickets on hand for our group but the ladies researched and called Timbavatis to see what could be done. One of them then drove to Timbavatis to purchase more tickets and met us there to give us the rest of what we needed. Great customer service! They were quick to help and explain, the whole process maybe took 5 minutes, which was great. We had stayed in the property around the same time last year and had a few issues with the property. I did complain and was offered a discount to come back. We did that this year and all the issues were resolved and we were very happy with the experience overall. This is the second time that I have stayed in one of your houses. We have had wonderful experiences both times. The facilities have been very clean and very well kept. The team was able to be reached at any time and responded very quickly. They were always very courteous, friendly, and patient! we enjoyed our stay so much, that I have renewed my rental for next year for the arrowhead Trail's home. every one was very nice to deal with, they knew all about the houses and made it easy to pick. we all liked how roomy the whole house was. Did bump into each other. WILL ALL STAY AGAIN. got the date set for next time. Awesome, friendly, cooperative staff! Very accommodating. Very comfortable and very easy to communicate with. (Email, phone or in person) Very pleasant experience. Everyone was extremely helpful and nice! We rented Arrowhead and the place surpassed our expectations! This was our first time going on our annual skiing trip in Wisconsin and everything was perfect! The staff was extremely friendly and helpful and the place was perfect! Friendly staff. The only thing we could have used was a security code to shut off the Brinks Alarm System. Better than expected vacation property. Far enough away from neighbors were you can have your privacy. Still close enough were you could make a trip into town. We've rented properties with Sand County Rentals several times and we're always happy with the service from the staff. Arrowhead Trails is a very nice out of the way property. Very nice appointed.